Western blot analysis of extracts from various cell lines using TPP1 (D4E2R) Rabbit mAb (upper) and β-Actin (D6A8) Rabbit mAb #8457 (lower). 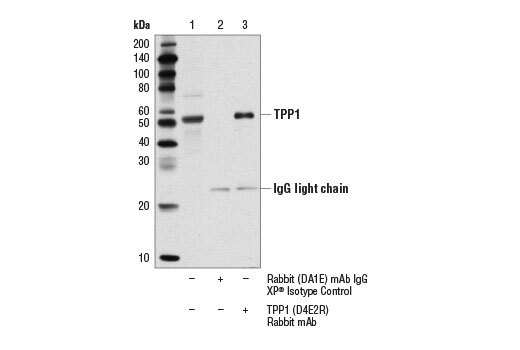 Immunoprecipitation of TPP1 protein from Hep G2 cell extracts using Rabbit (DA1E) mAb IgG XP® Isotype Control #3900 (lane 2) or TPP1 (D4E2R) Rabbit mAb (lane 3). Lane 1 is 10% input. 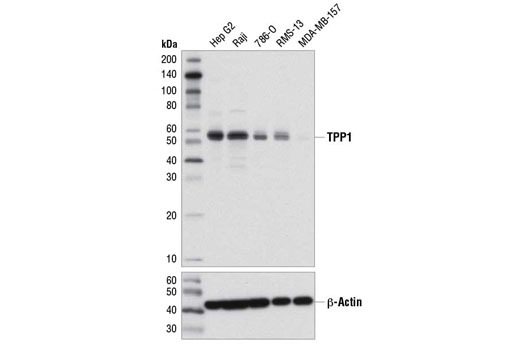 Western blot analysis was performed using TPP1 (D4E2R) Rabbit mAb. TPP1 (D4E2R) Rabbit mAb recognizes endogenous levels of total TPP1 protein. Monoclonal antibody is produced by immunizing animals with a synthetic peptide corresponding to residues surrounding Glu169 of human TPP1 protein. TPP1 is encoded by the the ACD gene, and is one of six core proteins of the shelterin complex (TRF1, TRF2, Rap1, TIN2, POT1 and TPP1) that regulates telomere length and integrity. This nuclear protein complex localizes to telomeres, and protects the natural ends of chromosomes from inappropriate processing by DNA repair pathways (1). TPP1 was identified in screens for proteins that bind TIN2, which is considered to be the central component of the shelterin complex (1). TPP1 contains two protein-protein interaction domains that facilitate shelterin complex function: a carboxy-terminal TIN2-binding domain and a more central POT1-binding domain. Heterodimerization of TPP1 with POT1 promotes binding to single-stranded telomeric DNA, which facilitates telomere elongation and protection by the shelterin complex. The TPP1 protein also contains a TEL patch, a collection of surface amino acids that recruits telomerase and modulates its processivity (2). In addition to playing an important role in normal development (3), TPP1 is implicated in the etiology of selected diseases. For example, mutations in ACD that alter the composition of the TEL patch have been linked to Hoyeraal-Hreidarsson syndrome, a clinically severe form of dyskeratosis congenita characterized by hematopoietic stem cell dysfunction, bone marrow failure, and a predisposition to cancer (4,5). de Lange, T. (2005) Genes Dev 19, 2100-10. Nandakumar, J. et al. (2012) Nature 492, 285-9. Tejera, A.M. et al. (2010) Dev Cell 18, 775-89. Kocak, H. et al. (2014) Genes Dev 28, 2090-102. Guo, Y. et al. (2014) Blood 124, 2767-2774.